The Plant Slant Poster is new! The idea is to show the benefits of a more plant-based diet so everyone can think about how their diet can help them achieve a more optimal health status. You do not have to be on a diet or be vegetarian or vegan to slant your eating towards plants! And plans benefit 9 different health points from vision to digestion to weight control to the avoidance of chronic diseases. The image of two positive, active bodies made up of brightly colored plant foods catches the eye. 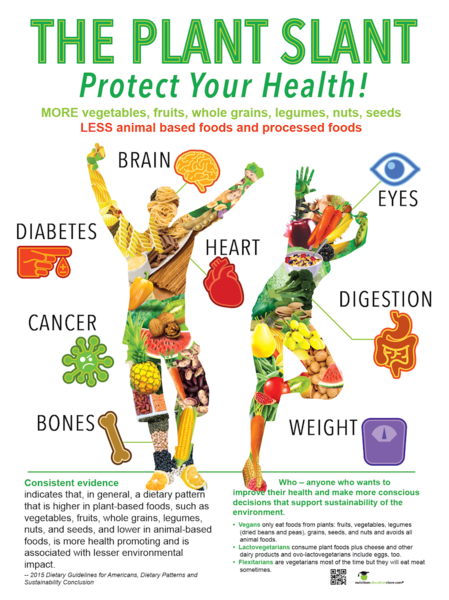 Just a quick glance at the poster shows how a plant-based eating pattern is better for the whole body (bones, brain, heart, eyes, digestive system) and influences body weight and the risk for chronic diseases like heart disease, certain cancers, and diabetes. The vibrant graphics encourage individuals to linger long enough to read that eating more plant-based foods is better for the environment. From vegans to lactovegetarians and flexitarians, there are different ways to enjoy a plant-based eating pattern. A dietary pattern that is higher in plant-based foods and lower in animal-based and processed foods promotes the health of your whole body. 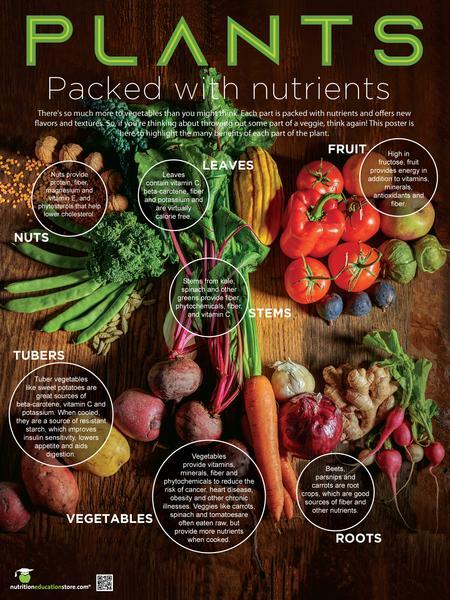 Plant-based foods include vegetables, fruits, whole grains, legumes, nuts, and seeds. Eating a plant-based diet supports sustainability of the environment. The definition of a plant-based eating pattern is broad. You can choose to include some animal-based foods (flexitarian and lactovegetarian) or avoid them altogether (vegan). Check out our entire plant slant promotion collection!